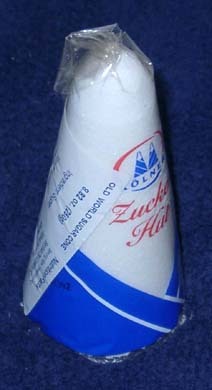 A cone was one of the ways to sell white sugar during the 19th century. This type of sugar was only one of many which will be discussed in an article being written for Citizen's Companion (see "links" in the page menu). The process to make sugar, including shaping it into cones is described in The Boy's Book of Industrial Information (1859). Period sugar cones were also much larger, sometimes weighing as much as 50 pounds. The practice of wrapping the cones in blue paper imparted a bit of the blue dye into the sugar and thus made it appear even whiter (just like the effect of bluing in the rinse for white clothes). We have also heard that there was some belief that the blue, either the color itself or the materials in the dye, repelled insects but we are still looking for documentation of that effect.